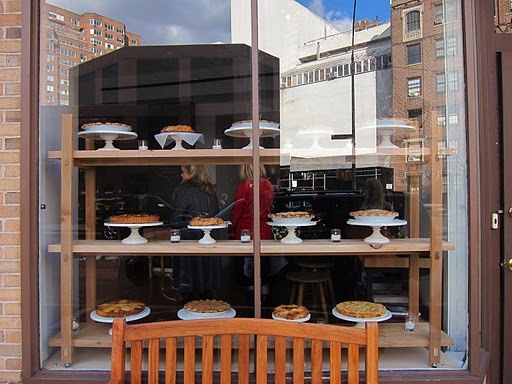 On a recent Saturday, with the baby Ergo strapped on and baby on board, I visited the Martha Steward Pie Pop-up Shop in Little Owl the Venue on Greenwich Street. This was a two-day only, one time event. And despite the barometer reading 2 below and windchill making it feel like 20 below, I was determined to not miss this epic treat. I had read that there were 9 different types (in miniature, savory and sweet) of pies for sale. But alas, there was a 1 pie per customer quota. Drats! My hopes of heading off into the sunset with 9 pies were quickly dashed. But Hubby and I left with 3 pies in hand–how did we pull off such odds? Why our Baby counted as a customer of course! One woman asked us if we rented the baby just to get extra pie. I wish! If I were that organized, I would have rented septuplets so that I could get my 9 pies! Bring in Da Funky Cheese!